There have been so many innovative developments in recent years within the double glazed windows industry, that those who first hung a piece of cloth in front of a gap in some stone would be stunned. Our windows are one the main features in any building, and have a number of functions. Keeping us warm in winter, cool in summer, protecting us from rain, snow, winds, noise, intruders and insects. Windows have a large range of tasks, and we expect them to do this continually. Apart from their practical aspects, they must accentuate the home, and make it look attractive. Styles, colours and details are all important, but they also have to be secure and robust. The latest high quality windows on the market tick all of these boxes and more, so that the emphasis has recently focused equally on style. We are delighted to offer a real hi-tech breakthrough product which is taking the market by storm. UK company Liniar have merged technology with innovation, and the result is their stylish selection of flush fitting windows. 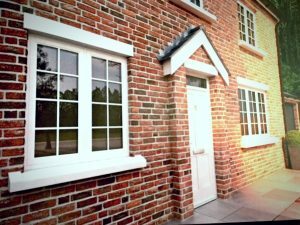 Sleek, attractive and functional, these windows perfectly replicate timber frames, yet have all of the advantages of UPVC. They also incorporate patented double-action bubble gaskets to provide a continuous seal for exceptional thermal efficiency. This streamlined solution ensures no draughts, and these systems are 100% lead free and 100% recyclable. Plus they come in a variety of colours, finishes and configurations to suit any property or project. The Liniar Residence R9 is a nine chambered window system perfect for homes or businesses. It offers British made, high performance, ‘A’ rated windows with a unique flush design. You can be sure of security too, as they have police approved ‘Secure By Design’ certification. This means they provide excellent protection against burglars, and are a police preferred product.